In the 1820s merchant tailor John George Rohr was an industrious man. A German immigrant, he recognized that the rapid development of the Canal Street area—just a few years earlier worthless pastureland called Lispenard’s Meadows—would be more profitable than the apparel business. In 1819 the “canal” down the center of Canal Street (actually, it was more accurately a drainage trench) had been covered over to create a sewer and Canal Street suddenly became an expansive, 100-foot wide thoroughfare. The major east-west road quickly developed with mixed-use structures; most with commercial space on the street level and living quarters above. Around 1820 Rohr began building near-matching two-and-a-halfstory brick buildings along Greenwich Street on leased Lispenard land, just north of Canal Street. Most likely a relative, also named John Rohr, who was a mason and builder was responsible for their construction. By 1826 the Rohrs’ had erected a string of 16 Federal-style houses on Greenwich Street—five south of Canal Street and eleven north. That year they added two more on the south side of Canal Street, between Greenwich and Washington Streets, numbered 239 and 241 (Decades later, in 1860, the houses would be renumbered 506 and 508.). Like the rest of Rohr’s houses, No. 241 would have a store in the first floor and living quarters above. The new homes, however, were three stories tall and Rohr included an unusual cast iron shop front. The shallow, paneled pilasters supported cast iron arches that mimicked the arched doorway. Rohr rented the house at No. 241 to Moses S. Phillips. Three years later James H. Greenfield opened his china store here and would remain for about three years. In the meantime, Roderick Sedgwick, a merchant doing business at 39 Front Street, leased the upper floors. In 1840 John G. Rohr sold No. 241 to Frenchman Joseph Batby, a 36-year old “ivory-turner.” Ten years later Batby and his family—wife Sarah and their four children—were still here. Anthony, their son who was now 16-years old, was already earning a living as a jeweler. In 1850 Batby was renting rooms to other families as well. Another French immigrant, George H. Denot and his wife, Maria, were here; John and Catherine Flaherty; and the family of Irish-born stonecutter James Sinnot: his wife Mary, their daughter Catherine and Mary’s mother, Mary Kennedy. Joseph Batby’s heirs sold the property in 1870. Henry Wellbrook and his family were living upstairs here in 1872. On Thursday afternoon, May 9 burglars broke into the apartment while the family was out. The New York Times reported that “The place was ransacked, and $300 worth of wearing apparel and jewelry taken.” For a family renting small rooms the theft was no doubt devastating. The $300 loss would amount to about $5,000 today. Matthew Thompson purchased the property in 1882 and built a one-story adjoining workshop to the rear that covered the back lot. Upstairs the tenant list continued to be a broad mix. Among the renters at the turn of the century was retired police officer Peter Kelly. Whether Joseph Thompson was a relative of Matthew Thompson is unclear, but by 1908 he and James J. Moran ran their plumbing company, Thompson & Moran, from the store space. Thompson lived here as well and in 1914 he got himself into a bit of trouble. In 1941 the ground floor was converted to a restaurant and in doing so the wonderful cast iron shop front was removed. A brick front replaced the cast iron, thoughtfully laid in Flemish bond. Throughout the 20th century the little brick structure was home to a variety of businesses. Then in 1980 Kipp Osborne and his wife, Margot purchased the house, rearing their daughter here. For a period they ran "Osborne and Osborne" from street level, designing and building custom-made hardwood furniture. Marketed as “furniture-as-art,” each piece was dated, signed and numbered. Kipp Osborne then renovated the street level into the Canal Park Playhouse, a theater-caberet. The upstairs was converted to The Canal Park Inn, a bed and breakfast, which opened in 2011. 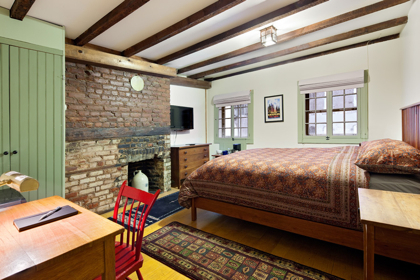 The four rooms (each named for a former owner or resident) were decorated with a nod to the history of the structure. That odd cast iron storefront used to be on the JE Bassett building in New Haven, very interesting. What a wonderful history and so well told...will book a stay in the near future.